X-Ring Lube was developed by the Lodi Kid to allow a shooter to complete a relay without wiping between shots. It is also designed to achieve a high level of sustained accuracy, hence the name ... X-Ring Lube. X-Ring Lube is “MATCH PROVEN”. We compete only in Long Range Creedmoor Matches at 800, 900, and 1,000 yards. 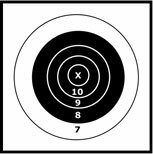 The time allowed is 35 minutes to fire 15 shots for score at each distance in addition to sighting and ranging shots. We do this for two consecutive days for a total of 90 shots for score to achieve the Grand Aggregate totals at the end of each match. Some states hold Long Range Matches requiring that only 10 shots be fired for score. We feel that (10 shots for score vs. 15 for score) does not make the equivalent demand’s on their lube. I find the additional 5 shots we fire DOES significantly increase our barrel temperatures. Therefore my impression is that if X-Ring Lube has “Match Proven” itself in Long Range Match Competition, it should also be helpful to the Competitive Silhouette Shooter. You can check out my Match accomplishments using X-Ring Lube for the last year in our “Match Results 2004” (and downloadable pdf file) portion of this web-site. Thank You for visiting our web-site and I hope X-Ring Lube will help you get in the winners circle as it has helped me. Click Here to Download the X-Ring Lube Order Form in pdf format. If you don't have Adobe Acrobat Reader, it can be downloaded for free from Adobe at http://www.adobe.com/products/acrobat/readstep2.html.